A method of fabricating ceramic objects (typically brick, tile and sometimes flatware) where clay powder is pressed under high pressure (e.g. 500 kg/cm2) into metal molds. The binding mechanism is either water or binding additives. This method of production requires minimal drying facilities and lends itself well to mass production in a continuous process. Tile companies have learned how to press and fire tiles of more than one square meter. The tile sector of ceramic industry is by far the largest and it has seen amazing automation and innovation in recent years. Large tile manufacturing plants measure their output in square kilometers. The largest tile producing countries include Spain, Turkey, Italy, Vietnam but dozens of countries around the world produce tile. The press and kiln are the backbone of most production plants. Large manufacturers hire press managers, supervisors, operators, mechanics and feed operators. Bodies now usually contain binders and lubricants and are often pelletized (as opposed to working with high water content (6-8%) powders). Potters and small manufacturers almost never use this production method. However it has great potential for anyone. Interestingly, the burden of making it work well is more on mechanical personnel rather than ceramic technicians. In double-charge dust pressing one layer of porcelain powder is overlaid by another powder and the two are pressed into the mold together. This method is advantageous to produce a higher quality or more expensive surface using a less expensive base. It is also possible to fabricate and glaze ware (e.g. tableware) in one manufacturing step using this process. Manufacturers typically face challenges in matching the thermal expansions of the two materials, when the match is not right the tiles fire convex or concave. 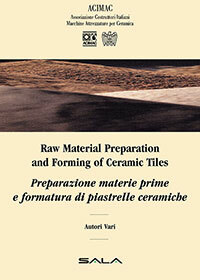 This book is in Italian (unfortunately none of the world's tile producing countries speak alot of English). Yet the tile industry is the largest single market segment in ceramics and the largest user of materials and energy. The tile industry is at the cutting edge of inkjet, engobe, specialty glaze and firing technology. They are also experts at dust pressing. 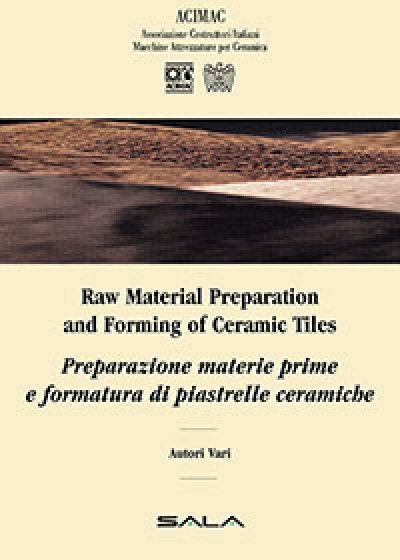 This book can be found at http://www.tiledizioni.it. The fine mineral, oxide and clay particles used in ceramics often aglommerate during storage or even in the latter stages of production. These must be broken down for use in bodies and glazes for serious problems can result (e.g. fired speckle). A history, technical description of the process and body and glaze materials overview of the monoporosa single fire glazed wall tile process from the man who invented it.